Furniture company HEKA has just launched what they’re calling the world’s first AI mattress, which can autonomously recognize and adapt to a sleeper’s needs in real time. HEKA is a membership-based retailer located in Delaware that designs and crafts high-quality furniture for its subscribers. In addition to its own furniture business, the company also has a strategic partnership with iFutureLab Sleep Medicine Center, who developed the AI TRACKBOT that HEKA uses in its innovative new mattress. He went on to add that it’s not the AI technology alone that supposedly the bed great, but how it works in concert with the mattress’ elasticity, softness, support, adaptability and durability to create a truly unique and superior sleep. Image courtesy of HEKA Inc.
iFutureLab SMC conducted over 30,000 experiments to perfect the AI TRACKBOT and found that it effectively reduces tossing and turning throughout the night, chances of waking up in the middle of one’s sleep and the overall discomfort experienced in muscle and spinal regions come morning. The constant adjustments of the AI TRACKBOT have also been shown to alleviate chronic neck, shoulder and leg pain as well as to ameliorate issues with nighttime breathing. Kent Scott, director of the AI TRACKBOT division of the iFutureLab SMC, explained in a press release that all users had to do before getting into bed at night was “simply input their individualized chronic pain information and sleep preferences” into the technology’s app and the TRACKBOT would take care of the rest. However, while this technology would certainly benefit all sleepers, it doesn’t look like this bed is going to be made available to the general public anytime soon. 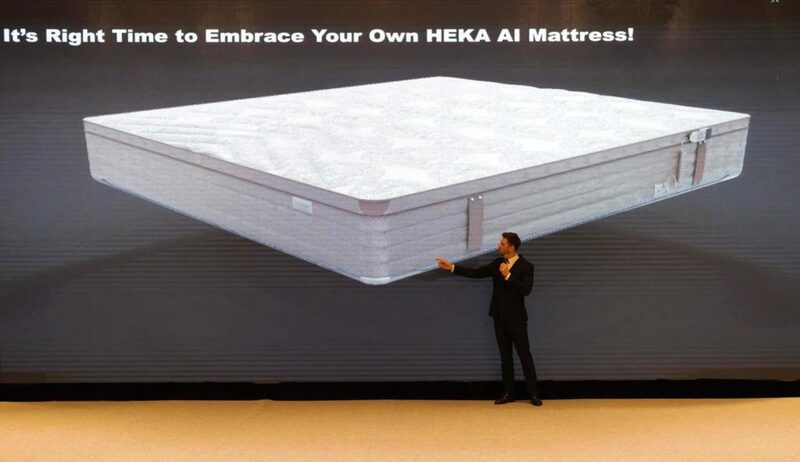 When announcing the launch of global pre-orders for the AI Mattress, HEKA made sure to point out that this bad boy would cost anywhere from $10,000 to $30,000. The most expensive version of the mattress comes in at $280,000, and has been reserved almost exclusively by members of various royal families, at least according to Smith. Too rich for your blood? Consider checking out one of our favorite mattresses of 2018 instead. Cody Gohl, thanks so much for the post.Much thanks again. Really Cool.